Surrender yourself to paradise at Matanivusi Surf Resort Fiji. Fiji's newest surf resort specifically built for discerning travelers who want surf, seclusion, service and satisfaction. Surf Fiji reef breaks while your partner / family relax in the comfort and luxury of the beachfront resort with fine food, and resort facilities including a swimming pool. Matanivusi Surf Resort Fiji is the ideal getaway with some of the best surf in Fiji just across the lagoon from the resort. Nestled between the white sandy beach and a meandering creek, the resort has been developed to protect its amazing location. Enjoy the rich unique environment at eco friendly Matanivusi. Matanivusi Surf Resort, situated on the Coral Coast on the main island of Fiji, Viti Levu, is the ideal place to get away from it all. This beautiful resort is protected in a small jungle filled cove and you can dive into warm blue water from the incredible white sandy beach straight in front. Surf local breaks and Frigate Pass. Rates - $560 FJD per surfer per day - includes private beachfront bure, full breakfast, poolside lunch and a delious dinner per day. Surf Transfers to local reefs included. Ask us about our Exclusive Whole Resort Charter and enjoy the features of Matanivusi exclusively for you and your guests. The accommodation has been designed to achieve the integration of the natural landscape with the living area. There are large amounts of glass and louvres that allow the cool sea breezes to ventilate the units. Ceiling fans, ensuite bathrooms and a large deck area are features that make the simple designs a pleasure to stay in and only a few steps from the ocean. The accommodation bures are tucked between a creek at the rear of the building and coconut palms, exotic flowers and plants at the front, then the beach. If you are there at the right time you will be able to pluck a ripe paw paw from the tree near your bure. A large variety of fruit trees are scattered around the resort. Each bure is divided into 2 separate accommodation areas with their own en suite. The room is tastefully furnished with a king size bed (or 2 king singles), mosquito net for that tropical feel, a coffee table and relaxing chairs. All rooms are screened. 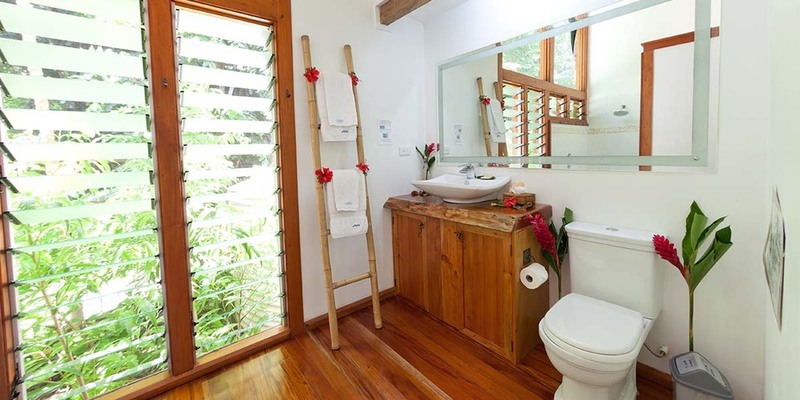 The large deck and vast expanses of glass gives each unit breathtaking views of the beach and rainforest, even from the toilet! There is surf all year round in Fiji, but like anywhere else cannot be guaranteed. There are 2 surf seasons. One is from April to October when the low pressure systems in the Southern Hemisphere produce consistent ground swells which can get up to 8 to 10'. The cyclone season from December to April is associated with shorter swells, however the conditions could be called ‘tropical' as it is glassy or light winds all day and extremely hot with afternoon showers. This is the time when the local breaks fire up. During the winter season, the SE trade winds which are offshore at Frigates can blow very strong (20-25knots) for up to a week at a time. The surf which is all outer coral reef and over head high can be challenging for inexperienced surfers. For this reason surfers need to be competent and confident. Recommended surfboards would be a 'hotdog' short board and a larger semi-gun for the bigger days. Board shorts can be worn year round, a rashie and sunscreen are needed for sun protection and booties are optional for the reef. Only a short boat ride from Matanivusi Surf Resort , are three right hand reef breaks that, depending on the wind, tide and swell, can offer the experience of a life time. While twenty kilometers offshore is the world famous Frigate Pass. Boasting a maximum of 24 guests, our resort is the perfect get-away retreat for holiday makers, surfers and ocean enthusiasts. If you are interested in hooking up on some Trevally, Mahi Mahi, Yellowfin Tuna and Sailfish then this is the right place for you. Bottom fishing is also great around here with our massive Coral Trout and Red Emperors hiding in the local reefs. We offer half day and full day charters. If you are serious like surfers, we would recommend you bring your own equipment and favourite lures. The right tackle would be two trolling rods with about 50-80lb test and spinning rods with 30lb test for Trevally. Come see giant schools of barracuda and trevalley or massive coral reefs teeming with aquatic life. Dive Master Don has 15 years of experience in the local area and runs local dive trips directly from our resort. Not a diver? We are pleased to offer PADI certification on our premises with the use of our pool for your Discover Scuba lessons. We have local trips out to some of the most magnificent coral reefs fringing our lagoon, where you will find a wide array of parrot fish, sea turtles, spotted eagle rays, clown fish, sea anemones and large amount of soft and hard corals. Guests can snorkel inside the lagoon around the coral bombies or outside the fringing reef along the drop-offs. Take a nice morning cruise around the calm lagoon or an evening paddle to watch the sunset from the water. We can also take you by boat to the local creek where a guide will give you a tour of the surrounding area on your kayaks or SUP. The paddle boards are 11ft in length so they are easy for everyone to ride even children and are a great family activity. Also a fantastic way to view the aquarium below. Take a guided trip up to Korolevu where we will take you to a tropical waterfall hidden away in the lush jungle. The plantation walk will give you a better understanding of the traditional village subsistence living and medicinal plants. If you are interested in something romantic we offer sunset tour on our Noosa Power Catamaran with beer, wine and appetizers. If you want your whole group to come out for a little sunset party on the boat then that is fine also. We are only able to do this tour on an evening high tide. Massages, Beach volleyball, Yoga centre, bocce balls, ping pong, board games, entertainment room, Ziplining, Whitewater Rafting, Mountain bikes and a library.